Terung Asam are small, elongated, round fruits that measure an average of 8 centimeters long and 6 centimeters in diameter. The skin matures from green to a yellow-orange, red-orange or dark purple depending on the variety; some fruits exhibit dark purple to black variegated stripes. The firm flesh is orange and surrounds a soft central cavity containing dozens of small seeds. The aroma of the flesh is like that of a tomato, and it has a sour, acidic flavor. Terung Asam are available year-round in Borneo. Terung Asam, which means Sour eggplant in Malay, has several botanically classifications including Solanum lasiocarpum and Solanum ferox. They are members of the nightshade family, related to tomatoes, peppers, and are mainly found in Southeastern Asia. The small fruits are also referred to as Sour Brinjal, Terong Bulu, Terung Dayak, or Terung Iban, named for the largest indigenous group in Sarawak. 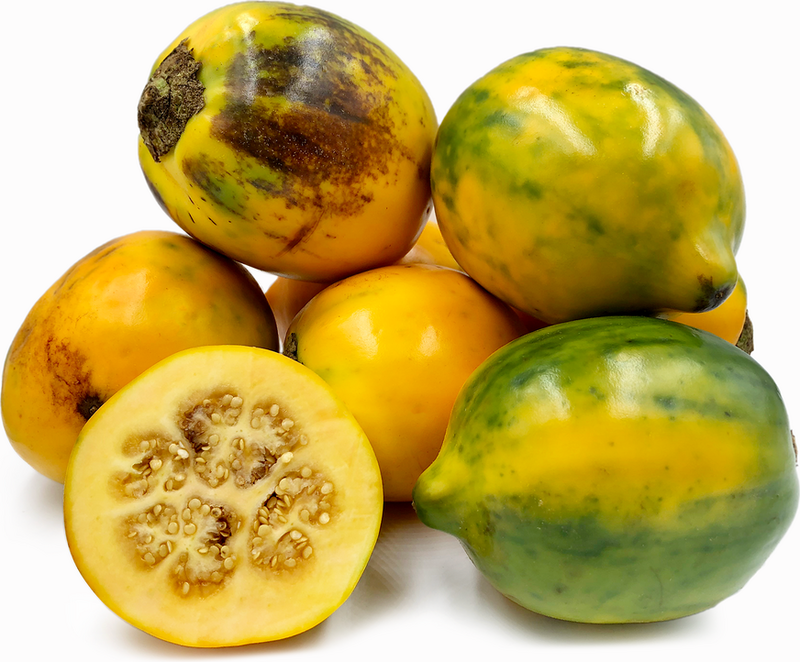 The fruit was granted a Protected Geographic Indication status in 2011, meaning its reputation and characteristics are tied to the region. Terung Asam is a good source of vitamin C, and contains calcium, fiber, phosphorus and potassium. Terung Asam is primarily used in fish soups, curries and sauces. They are cut into quarters and cooked with or without seeds. Peeling is unnecessary as the skin comes off easily when steamed or boiled. The fruits are sometimes used as a substitute for tamarind, because they offer a similar sour flavor. Terung Asam can be eaten raw in salads, when they are immature and still green. The fruits pair well with tamarind, turmeric, chili, coconut milk, smoked meats and smoked fish. Slices of Terung Asam can be dehydrated and will keep for up to a year if stored in an airtight container. Terung Asam will store well, for up to a month, though the skin will begin to wrinkle due to moisture loss. In Borneo, Terung Asam are consumed by the Dayak people, and used in asam pedas, or sour/spicy fish dishes. In Sarawak, Terung Asam is combined with chiles, lemon grass and onions and cooked with shrimp paste, anchovies or dried shrimp, the fish is added last. The fruits are also used to make sambal, a paste made from red chiles, bird’s eye chiles, belacan (shrimp paste), and calamansi lime juice, all prepared with a traditional stone mortar and pestle. The sambal is served with fried tempeh, chicken or fish. Terung Asam are native to the island of Borneo in Indonesia, specifically the northern part of the island known as Sarawak. The fruits have a Protected Geographic Indication for that area, though they also grow on the other side of the island, known as Kalimantan. They have been found growing in Indonesia and the Philippines. In the wild, Terung Asam can be found growing in ravines and valleys in wet, humid environments. They are both a foraged and a cultivated fruit, and can be spotted at street markets and vendors in Borneo. Recipes that include Terung Asam. One is easiest, three is harder.